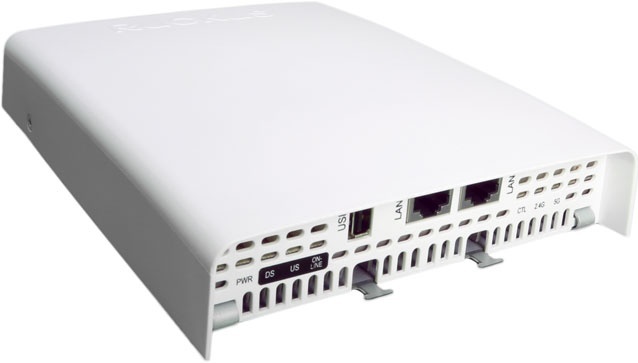 The ZoneFlex™ C110 combines a Wave 2 access point, a DOCSIS 3.0 cable modem and an Ethernet switch to deliver wired and wireless connectivity over coaxial cable infrastructure. Patented BeamFlex+ technology rejects interference and improves wireless signal quality for any device, anywhere. Included MU-MIMO technology maximizes network efficiency, reducing bottlenecks and enhancing user experience. The C110 addresses the urgent need of hotel and multi-dwelling unit (MDU) property managers whose facilities are wired only with coaxial cable to deliver high-speed Internet to guests and residents. With the C110, property managers no longer need to re-cable their buildings with Cat5 in order to provide Internet access. Now, they can offer new services such as IPTV and VoIP in addition to great Wi-Fi—all over existing coax. The C110 is supported by Ruckus controller appliances such as the ZoneDirector and SmartZone or the software-based Virtual SmartZone. With the power of these controller platforms behind it, the C110 enables hotels and MDUs to deliver to their guests and residents enterprise-grade Wi-Fi features such as guest access, tiered Wi-Fi services and Hotspot 2.0. The C110 delivers world-class reliable wireless connectivity, improving customer experience and enhancing customer loyalty without the need for cost-prohibitive infrastructure upgrades. C110 will be sold by approved DOCSIS Brocade Partners only as its installation requires specialized knowledge of Cable Modems and CMTS equipment. Please contact local Brocade sales team on all C110 opportunities.